Hello again, OK friends, go and get a cup of coffee or a looooooong drink, settle back and relax for we are going on a 10 day trip to Vienna. 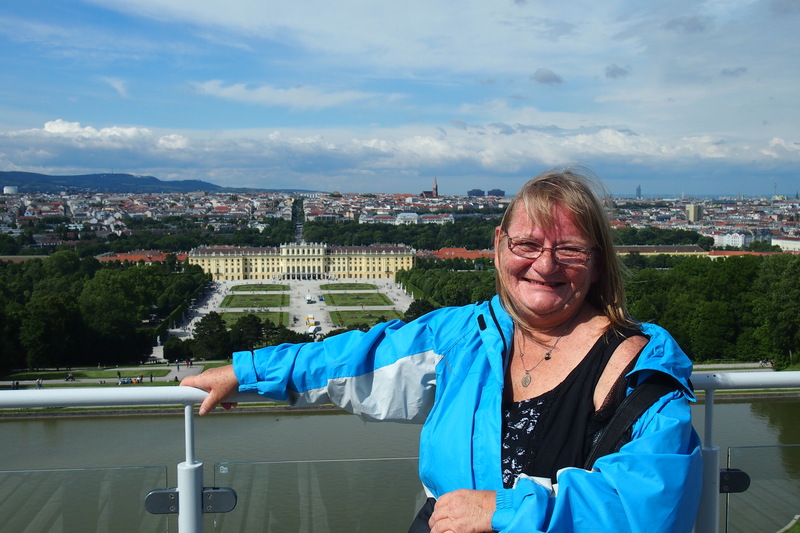 I did a lot in Vienna in a short time, regardless of the weather conditions. And so it was time to leave Ljubljana for Vienna, this time on my own as my son Ginski had to leave a few days earlier, heading back to Utila. It had taken a few days to decide where to go next. This was the beginning of a pattern that would continue for the rest of my travel. I left the ideas up to the gods and followed my intuition, in that way I always ended up in fascinating places that I may not have even thought of had I over-planned the trip. First a taxi to Ljubljana station, yes it’s a walkable distance but now that I was on my own I had to deal with my own luggage. When I was getting ready for this first leg of solo travel my son Nick’s question to me in Italy ‘How are you going to manage all your luggage when you are on your own?’ rang in my ears. Up until this next bit of travel I had my kids with me and so there was lots of help. Now, on my own, I had to re-organise myself. The first decision was to take care of my physical health especially my back and so, sensibly, I decided that the cost of taxis to railway stations was worth the money, rather than spoiling my trip with discomfort from over-doing it. I only had 2 pieces of luggage, a wheeled carry on bag and a larger wheeled backpack. However, over a distance these become heavy and unpleasant to manoeuvre along footpaths, apart from which I still had the container with the remainder of Mum’s ashes and that didn’t fit into the luggage, so taxi decision was made. The train pulled out of Ljubljana station at 9.30am, we changed at Maribor. Next time I find myself in Slovenia, Maribor will be a definite stop. From all the images I have seen it is a beautiful city in the midst of wine country. However, last year was not the time. At first the scenery was quite normal, pretty and green of course but not spectacular (by now I’d been spoiled by the scenery of Lakes Bled and Bohinj) and then, there it was! 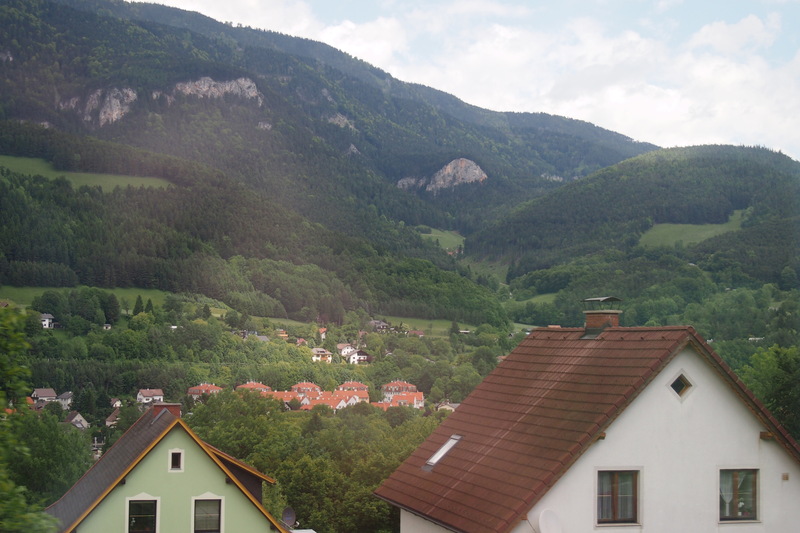 That view out of the train window as we crossed into Austria. The villages tucked into the folds of the hills or placed wherever there was some flat farming land, the red roofs contrasting the bare escarpments and the many shades of green trees. The white of the snow on the peaks in the distance accentuated by the green of the forests in the foothills. It was a journey through a postcard, stunningly beautiful and vibrant. I was sad when it was all left behind as the wheels clattered on to Vienna, but then there was the beauty of that city to see. Ah, travel! So much to see, so much to do and those constant farewells and hellos. My stop in Vienna was Wien Meidling, a nothing sort of station but it was replacing the main station which was being re-built. I can only assume that the main station is (or will be) more organised and better sign posted than the temporary replacement. There were no useful signs for taxis anywhere near the station and no recognisable taxi stand. I thought this was very un-Austrian. There are still smatterings of High School German left in my head, so I knew that I wasn’t misreading anything. I wandered around a bit and asked a few people where I could find a cab, most had no idea, luckily one helpful local lady flagged one down for me. I arrived at the hostel and started my usual thing of orientating myself through maps and questions. Anyway, after all that walking the previous day in Ljubljana and dragging my suitcases on and off trains that day I wasn’t about to go off exploring just yet. The hostel I was booked into was a large one and this chain of hostels doesn’t number their beds which is a nuisance because you can’t book a lower bunk. As I get older top bunks become no fun (actually I never liked top bunks, having had a tendency to fall out of bed as a child so have always avoided them where possible). Luckily I was first into that room so grabbed a lower bunk. I made a decision that in future unless I could book a lower bunk ahead of time I would stay in a different hostel. 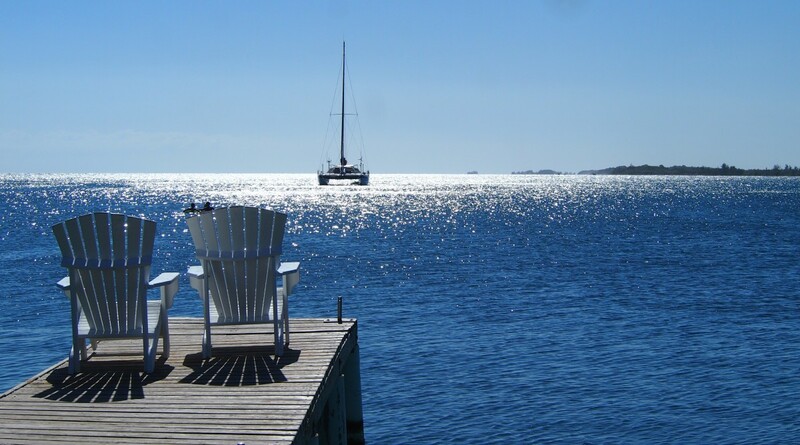 The unknown of bunk location can create unnecessary uncertainness, best to check ahead. This place had a kitchen, dining room and a bar but I was in that ‘couldn’t be bothered cooking’ mode, nor was I interested in going to the bar. They had breakfast for 3.80 euro, an all you can eat style with cereals, fruit, yoghurt toast, coffee tea etc etc but, unfortunately, I don’t normally eat that early in the morning so couldn’t get past coffee, and a bit of muesli with yoghurt. I rarely get my money’s worth in those all you can eat meals. However, Austria is an expensive country and I suspected that the hostel breakfast was actually good value. 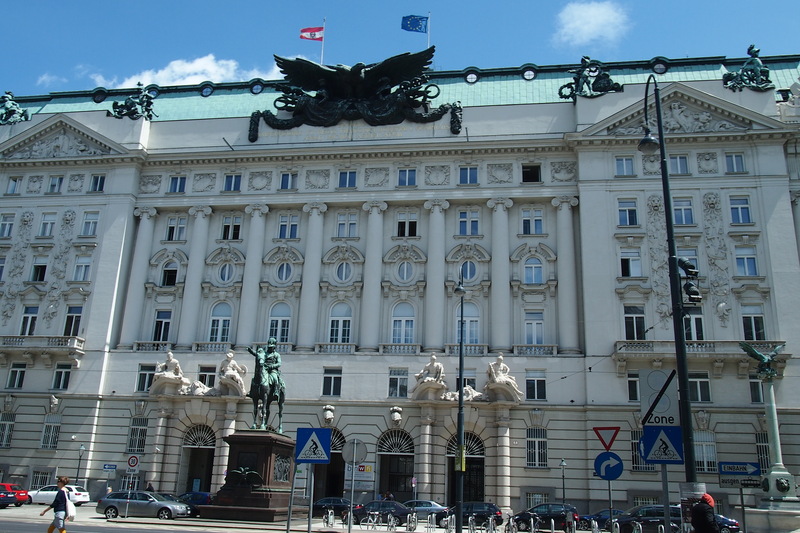 A piece of useful information from one of the receptionists was about the culture of the people in Vienna. I didn’t at first believe her but eventually I understood what she meant. 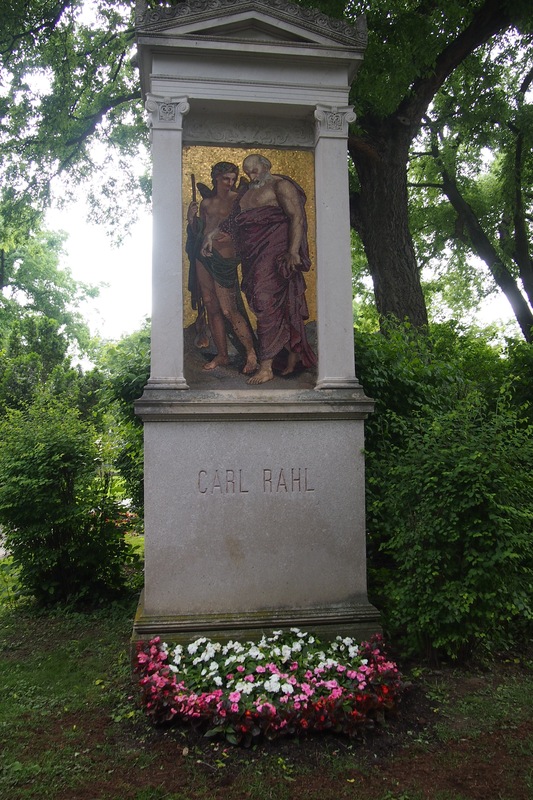 Her advice was that if people appeared to be arrogant, rude or off-handish to ignore it, that’s just how people are in Vienna. I did eventually understand, there does tend to be a bit of an off-handed and overbearing manner in general but especially in retail and hospitality, even at that hostel and definitely at my second hostel. After a good nights sleep I awoke refreshed and decided to figure out the underground train system and go exploring the old town. Wow! I didn’t know where to look next. All the buildings are spectacular, beautiful old architecture (I’m not keen on the boring rectangular shapes and glass and cement of modern buildings) . As I was walking along Babenbergenstrasse I couldn’t take my eyes off the architecture and decoration of the massive building I was passing. I wondered what it could be but couldn’t find an entrance or name. It was only after I turned left onto Burgring that I discovered that I’d been walking along the back of the Art History museum (Kunsthistorisches Museum) I decided that this was definitely going on the list of ‘must pay money and enter’ items. Matching it across Maria-Theresien Platz (a rectangular park with beautiful statues, fountains and a massive sculpture of Maria-Theresa) is the Natural History Museum. 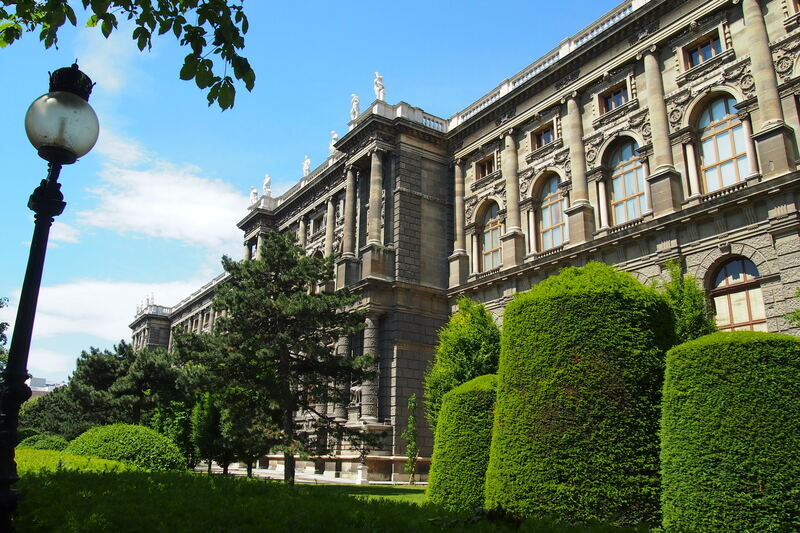 It apparently has the largest collection of meteors in the world, however I didn’t get to go there this time, maybe on another trip to Vienna. I was learning quickly that you can’t do it all and proritising is a must. 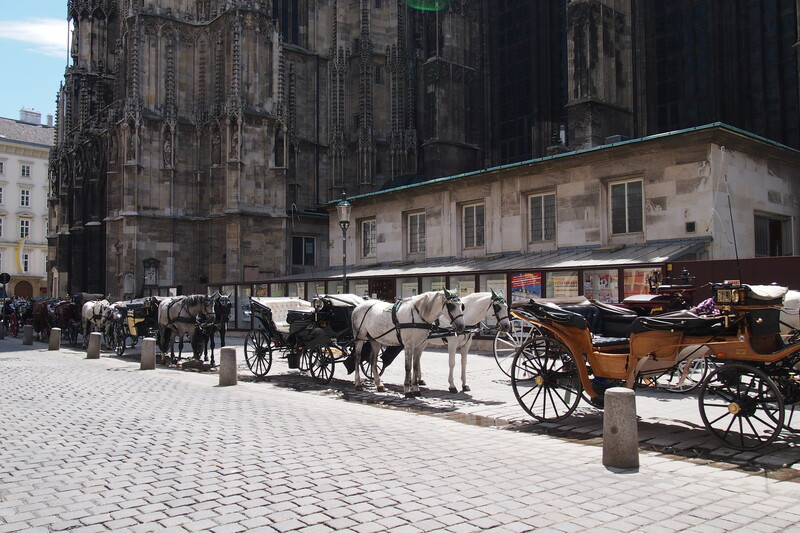 I started heading towards the Spanish riding school and noticed that there were horse drawn carriage rides going from there as well as an old looking tourist train thing (similar to the one I rode up to the castle in Ljubljana). Then I noticed the hop-on-hop- off sign. Although one of the girls at the hostel said not to bother with it that it was useless, I still prefer them for orientation. So for 20 euro I bought a ticket for all three lines and off we went. Of course if I were even ten years younger let alone 20 or thirty, I would have walked the entire city. Well! I was almost immediately thrilled that I’d decided to not take the girl’s advice. 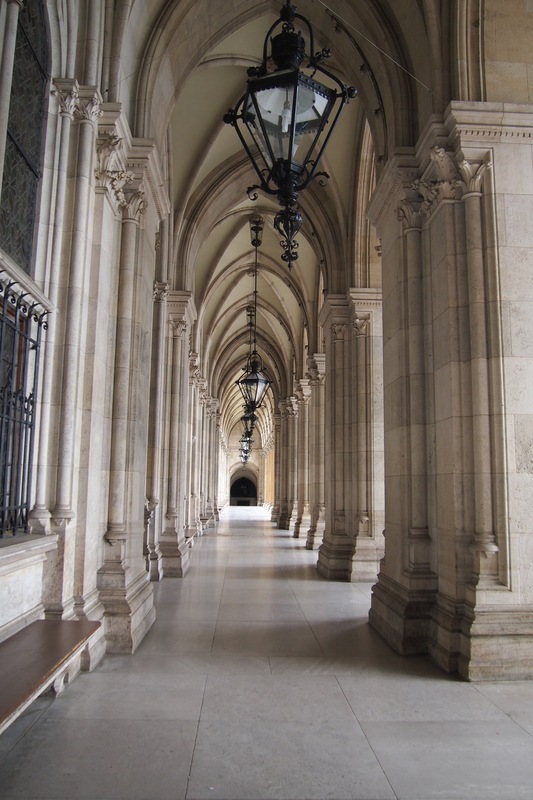 One of the first buildings we went past was the Parliament – a massive Grecian temple! And it just continued in the same vein. I ended up doing a huge amount of walking anyway as there were places I knew I wouldn’t get back to without doing the hop off part of the bus ride. 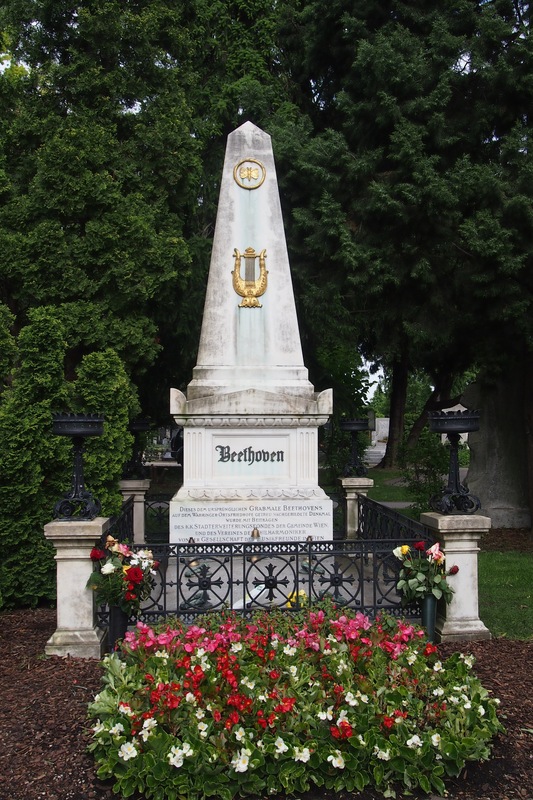 First was the statue of Field Marshal Joseph Radetzky von Radetz, yes the one in honour of whom Johann Strauss Snr wrote the Radetzky March. 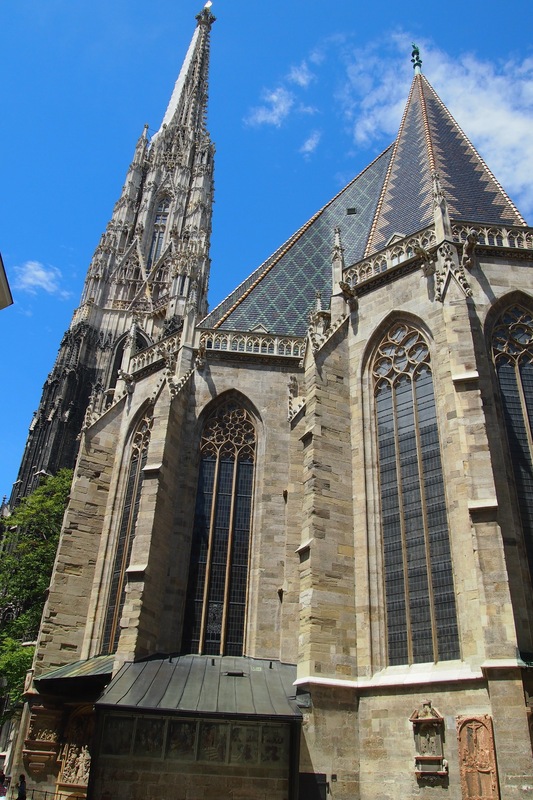 Then St. Stephen’s Cathedral (more commonly known by its German title Stephansdom) the church of the Roman Catholic Archdiocese of Vienna and the seat of the Archbishop of Vienna. It stands in all it’s Romanesque and Gothic glory in Stephansplatz. I believe that the funeral of the Italian composer Antonio Vivaldi was held there. Inside I was amazed to be greeted not by silence, gloom and candles but a vibrant colourful light show – amazing. 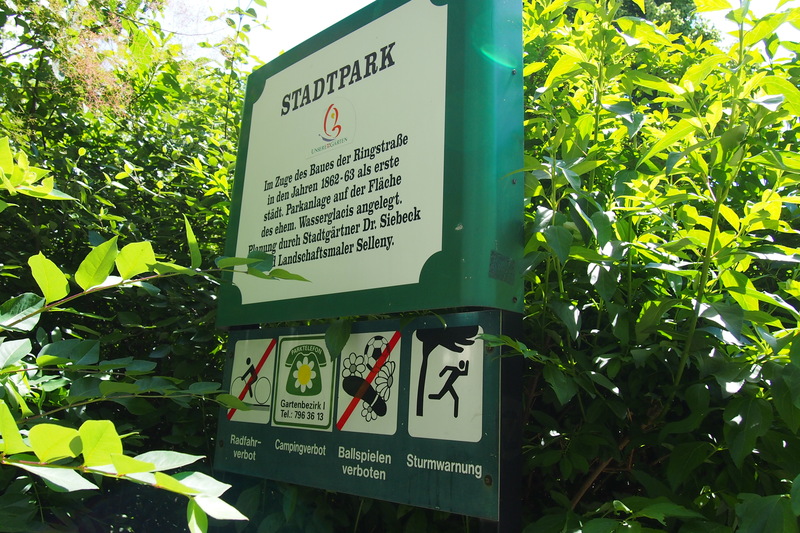 A bit of walking around that area (there was a cool shop with large Smurfs not far away) then on to Stadtpark. A beautiful park with plenty of seating and cool areas for people to sit and chat, out of the heat of the sun. Lakes, ducks, statues and flowers abounded. It was sheer delight to walk through, even though my poor old back was starting to complain bitterly. 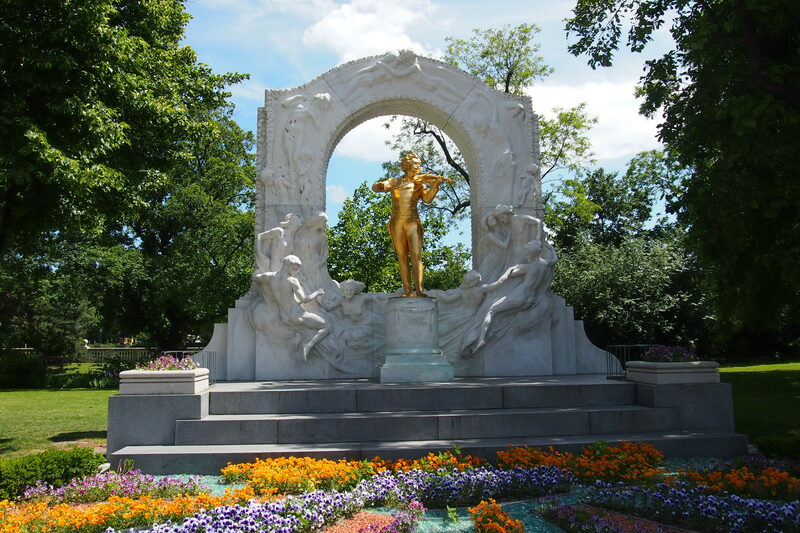 I came across what I have since found out is one of the most famous statues of a musician, the golden statue of Mozart. It is indeed stunning. Not far away was a restaurant and as it was definitely past eating time the decision was made, anyway I desperately needed a rest. A most unsatisfying experience unfortunately. 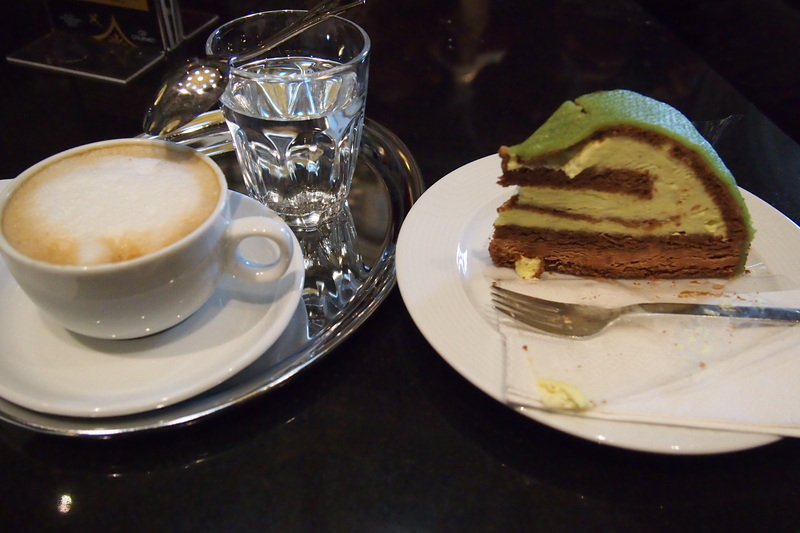 The coffee was OK, that’s where I discovered the Vienna Melange, a sort of cappuccino, but the food! The waiter raved about their cevapcici (a Serbian traditional dish that I love) so I thought that would be a reasonable thing to have. Dreadful! They were like rubber bullets and inedible. He apologised and reduced my bill which was rather decent of him. By the end of the 3rd bus line I knew I would never cover Vienna in just 4 days. So when I got back to the hostel I wanted to extend another week, but they could only extend for 2 extra days, till Sunday, so the search was on for alternative accommodation. Now that was a massive day! A cold, wet miserable day, I decided to stay indoors relax and do some research online. Little did I know that this rain was the edge of the European flooding rains of 2013 and that the rest of my stay would require either getting wet or not seeing Vienna. 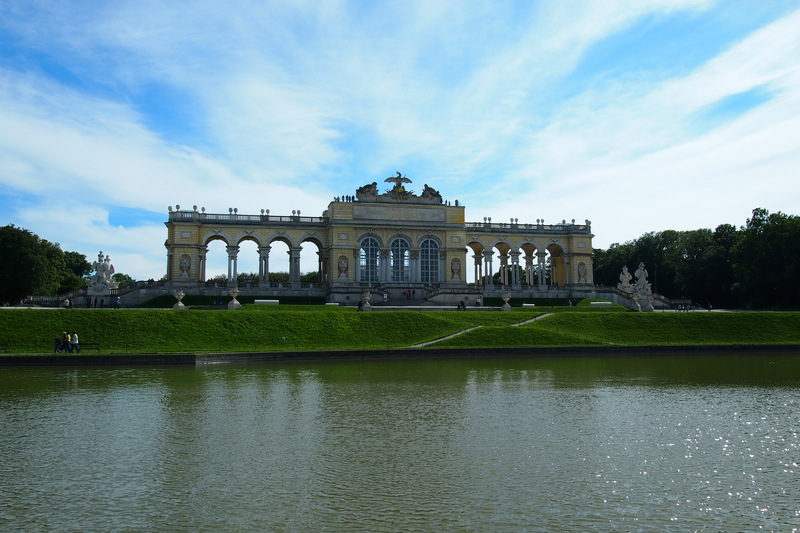 There was supposed to be a free philharmonic concert on the lawns at Schonbrunn castle that night but the website said that if it was bad weather they would move it to Friday night. It was bad weather! I was checking with the people at reception (just in case my German was lacking) about the concert and they also said that it would not go ahead in bad weather and so I stayed mainly indoors only poking my head outside to go to the supermarket at the railway station to buy supplies. The rest of the time there were chats with my dorm mates. One of the lovely girls was a Swedish architecture student. 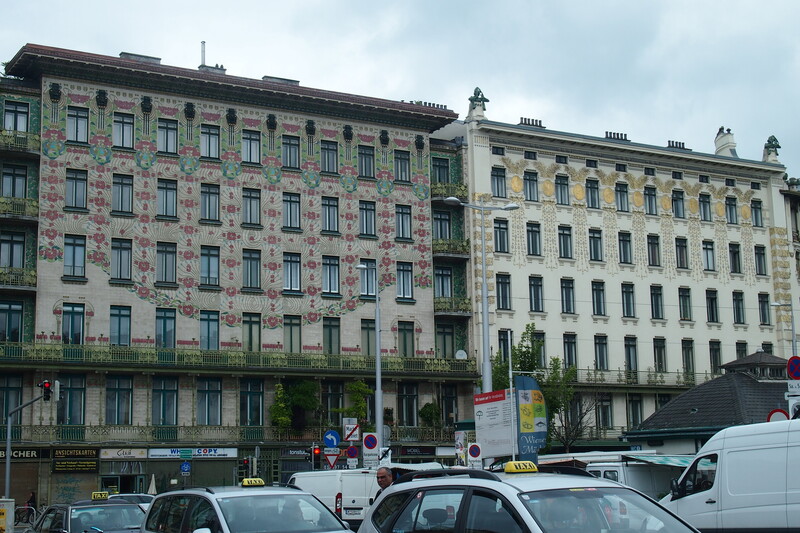 She was so excited when she looked out of the window and saw a building that was used as an example of the best art nouveau style. The building opposite the hostel which excited the architecture student in my dorm. I woke up to another cold and wet Viennese day. I went downstairs to find out when the concert will be and found that although the weather was bad they still went ahead with the concert the previous night, drat! The reason being that the weather forecast for Friday was even worse. I wonder how many other people missed a once a year concert because of their confusing website information. However, when I thought about it, given the weather I probably wouldn’t have gone anyway, it would have been quite miserable sitting out in the open in the freezing night rain. So what does one do on a cold damp Friday in Vienna? Why, go to the Art History Museum of course. On the way I came across a massive sports clothing store and gave in and bought a bright blue light all weather jacket, put my Bundaberg rum plastic poncho over the top and I was ready for exploring in the wet. Now, I’m no art connoisseur but I do like to go and investigate and see what I like and what I don’t. Well! Was I impressed ! The building alone is a work of art, inside and out. 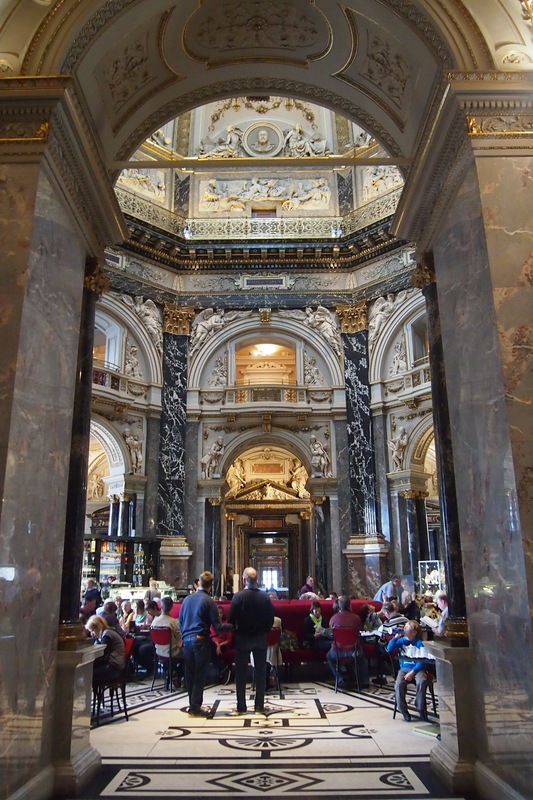 I was so grateful and thought it was very decent of Vienna to have re-opened the museum to the public on 1 March 2013, just in time for me to visit and experience. 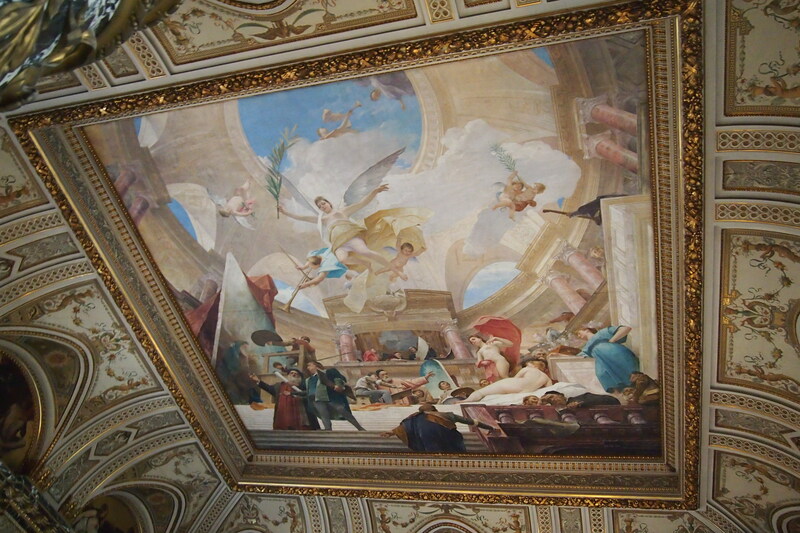 the gilt, the paintings on the ceiling, the domed hall – oh what an introduction to magnificence. 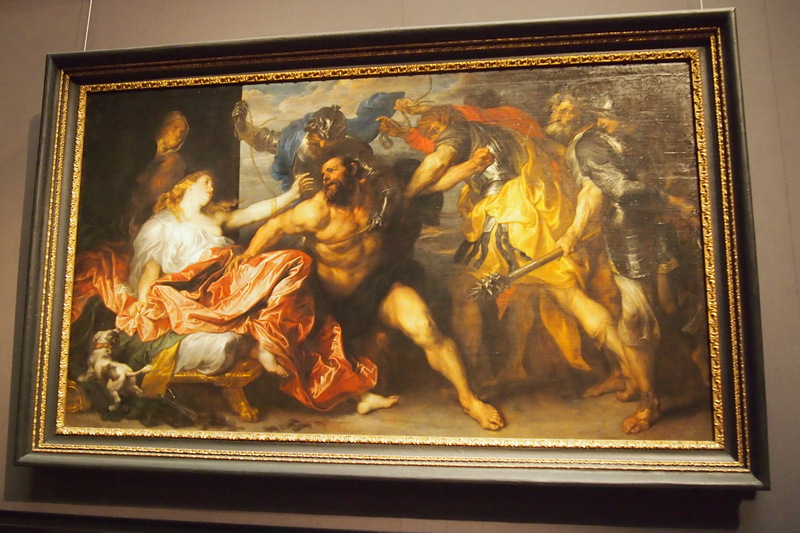 The collections are incredible, loads of Raphael, Titian, Caravaggio, Van Eyck, Tintoretto, Rembrandt, Pieter Brueghel the Elder and the one that captured me the most? 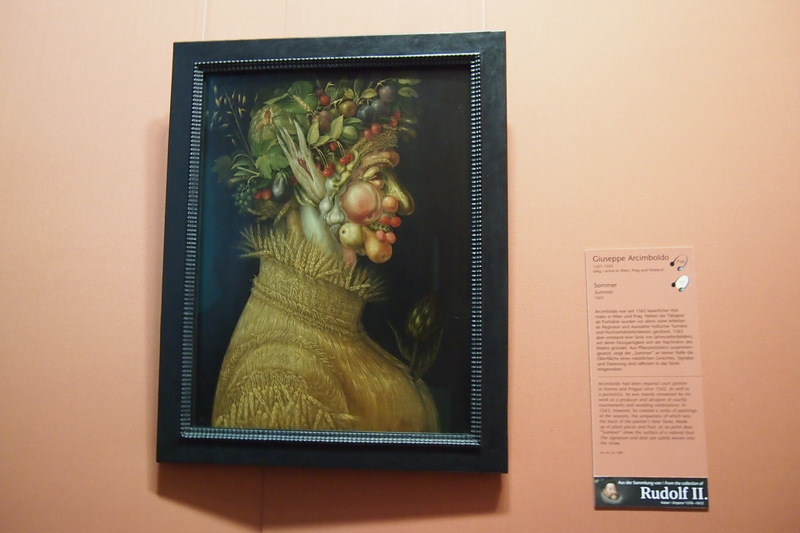 Giuseppe Arcimboldo, what a quirky artist, no wonder his Seasons paintings caught my eye. How awesome for a non-art person to have the opportunity to see and be educated in art that I may never see in real life back home. 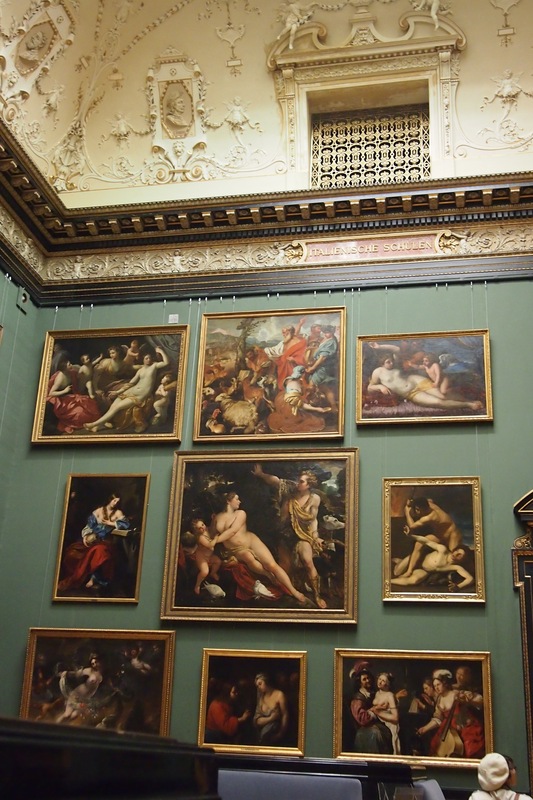 Yes our National Gallery in my home town of Canberra has some incredible collections and regularly has special exhibitions of various masters from around the world, but that is minimal compared to what is housed in the museums in Europe. 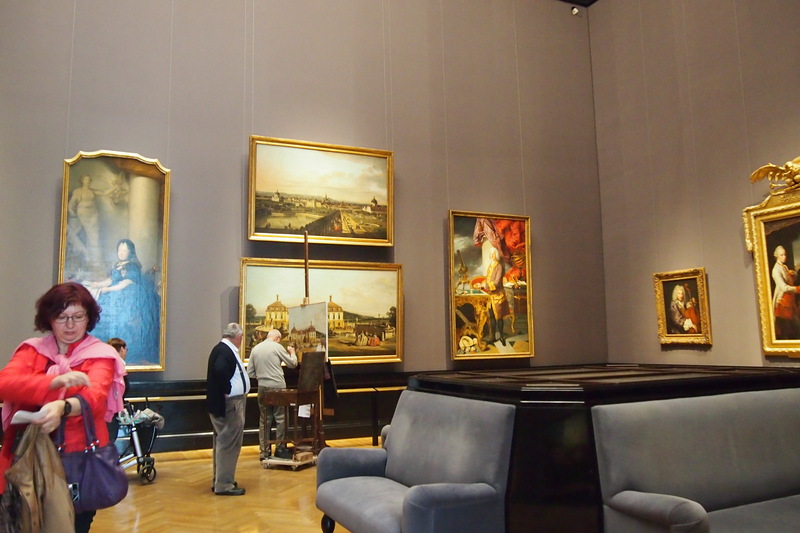 I was amazed that this museum allows current artists to set up their easels and copy some of the paintings. There was a fellow working on a copy of a painting of the castle while I was there. I was also amazed that they allow photography, it is a museum that believes that the art belongs to the people and should be seen whether people can get there in person or not. It took me most of the day just to explore the Masters and Egyptian galleries so I didn’t get to see much of the sculptures and the Greek and Roman antiquities, and none of the coin collection nor the library. However there was one very important place I wasn’t going to miss experiencing, yes, the café and restaurant. Luckily I went there mid-afternoon and so didn’t have to wait very long for a seat. Coffee, of course, a Wiener Melange (the closest thing to one of our awesome cappuccinos) and a piece of spectacular looking Mozart Bombe. I’d never had a cake covered in bright green icing before. This is the closest I got to the real Sacher torte as the base of the Mozart Bombe is Sacher, chocolate, pistachio and to top it off a covering of green marzipan. I’ve tried to find a recipe but haven’t succeeded yet although there are plenty of images of this wonder on line. I guess just as the real Sacher torte is a very closely kept secret so may the Mozart Bombe also be. A wonderful day and worth every penny. The cafe restaurant in the Art History Museum, what a stunning place to have afternoon tea. Good heavens! I opened my eyes to a dry morning, even the sun was trying to shine, which it eventually did. 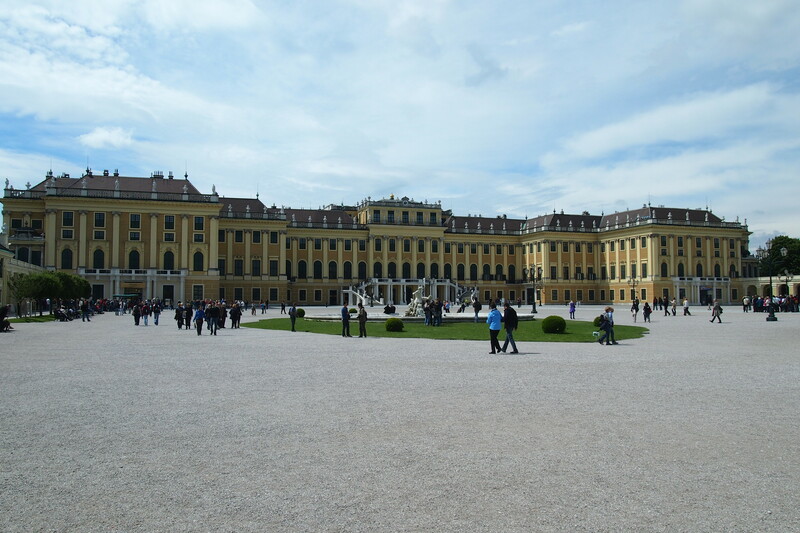 So I decided to go out to Schonbrunn. The castle was only a few train stations and a very short walk away from the hostel, so off I went. 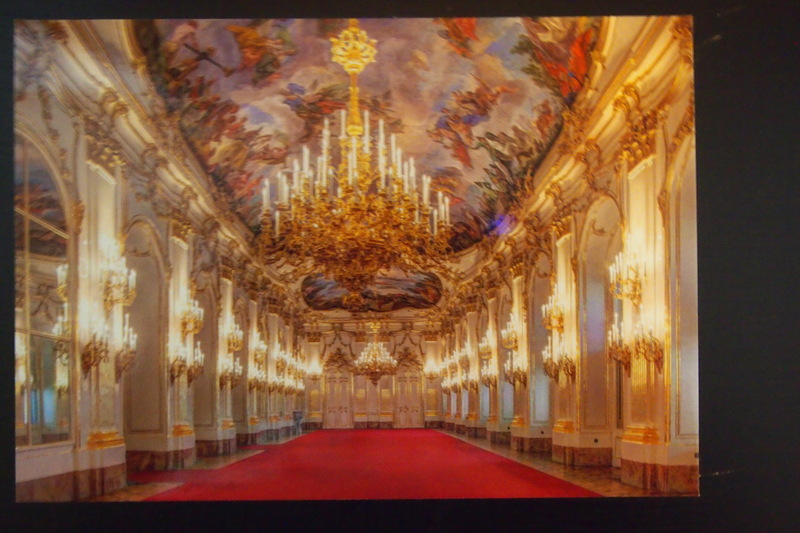 The first sight of the building was incredible, like most Viennese architecture, beautiful and ornate. 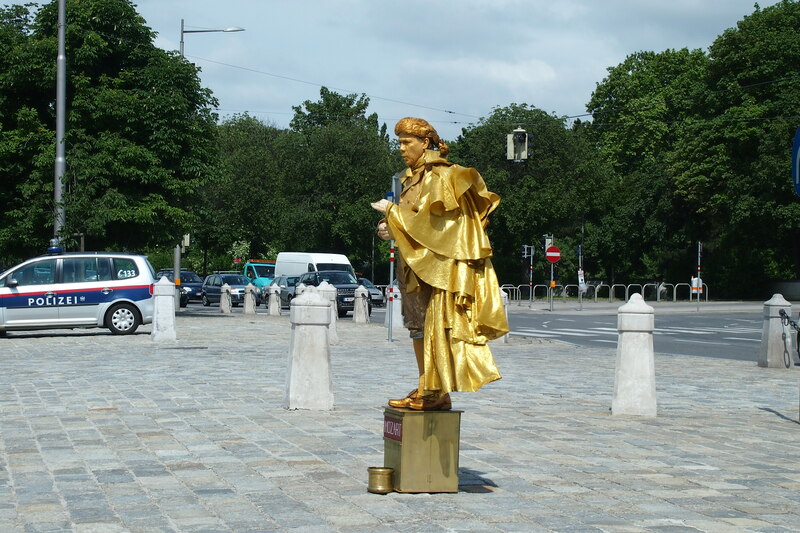 There was the obligatory ‘living statue’ on the footpath at the entrance, Mozart in spectacular gold. I had a little time to kill before my ticket time for the castle so of course off I went exploring a little of the grounds and found a café for coffee and an icecream. The rest of the grounds would be covered after the castle. The time came for me to enter the magnificent edifice. Sadly, of course no photos allowed so I later bought postcards and took photos of them. Inside, the castle was even more spectacular. Seriously, after the Art Museum I didn’t think that one could get more ornate, but oh yes, this was even more so. To think how many architects, artists, painters and builders were required to create this world of art, glamour and brocade. No words can describe it so below is a photo of one of the postcards instead. This bathroom in the castle made be blink when I first entered. it was time to explore the grounds further. Walking along the tree lined avenues with horses and carriages passing I was swept back to another era. If it wasn’t for the noisy tourists in modern dress it would have been easy to imagine oneself surrounded by princes, courtiers, kings and queens. I came to the treillage around the privy garden and as I walked in it’s shade the poet in me was finally inspired, so I sat and pondered a while, imagining the comings and goings of royalty, the peace in the shade and the colours of Autumn. 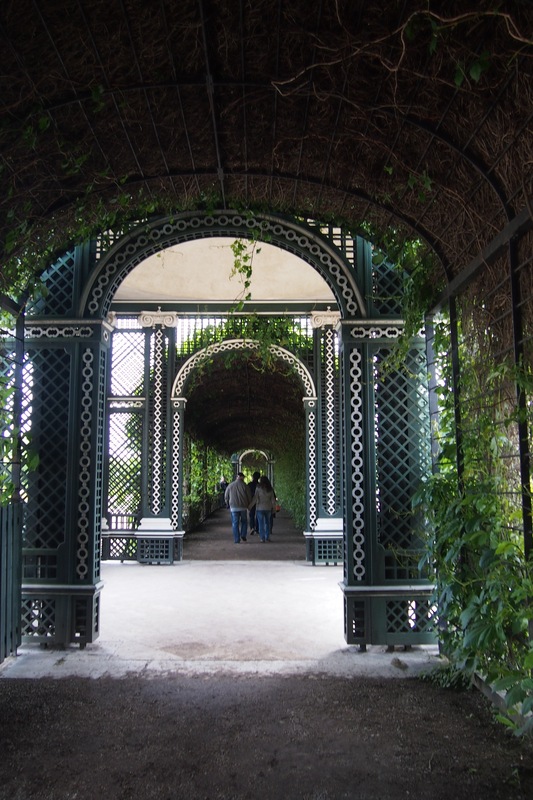 The geometry of the Privy Garden was just beautiful and quite a sight from the viewing platform above. 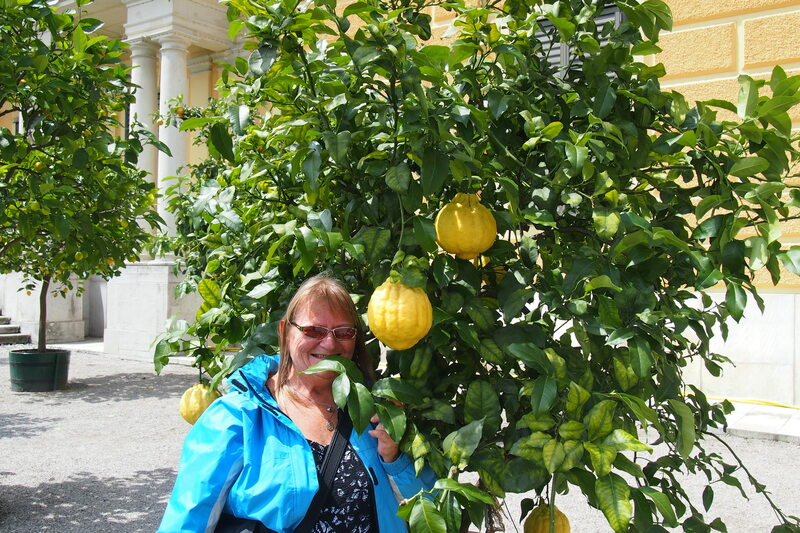 The rose gardens, the orangerie and there were those giant lemons again, the same sort we had seen in Naples. A lovely Russian couple was wandering around taking photos of each other, I offered to take a photo of them together (as you do when you travel) and they very kindly took one of me. Privy Garden from the lookout with the treillage on either side. Those huge lemons probably from Naples. Time came to move up the hill to the Gloriette. 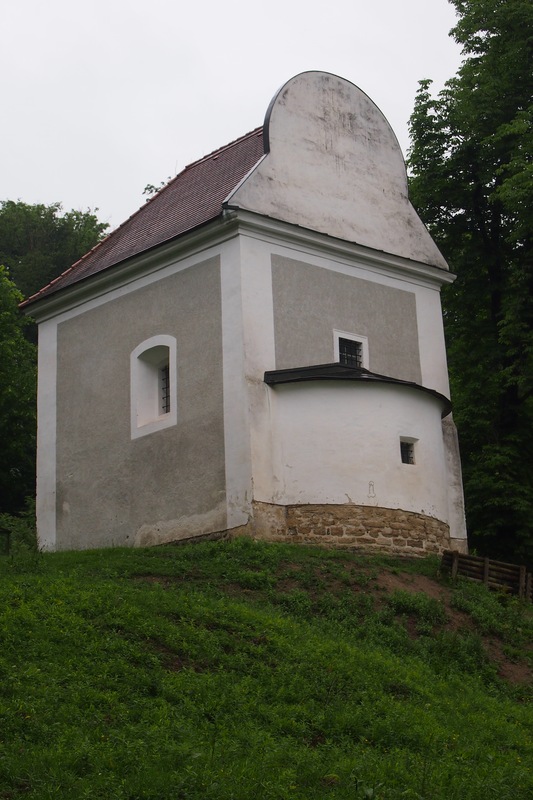 It was built in 1775 and is both a focal point and a lookout point. 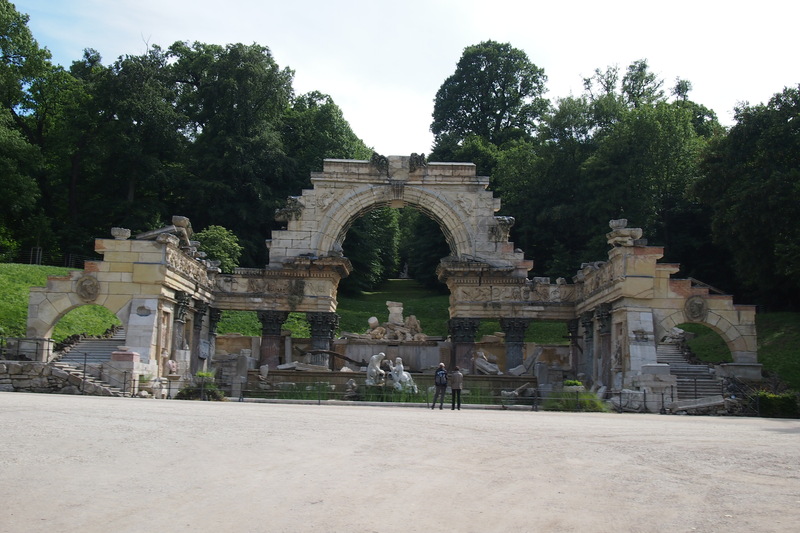 To get there you walk through a massive expanse of gravelled estate flanked by Romanesque statues,along treed avenues past the ‘Roman ruin’ folly, past another expansive geometric garden, along a winding track up the hill, past an astounding fountain to the beautiful Gloriette. From there looking back at the castle the view was magnificent. 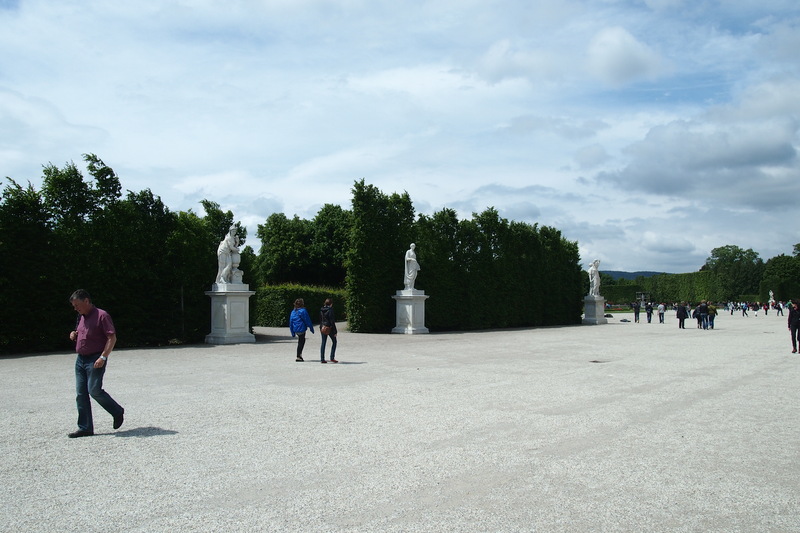 Schonbrunn and Vienna and at your feet, what beautiful design ideas they had back in those days. The ‘ancient ruins’ folly. Had me fooled until I read the plaque. From the top of the Gloriette to the castle. I moved from my first hostel to it’s sister hostel at Naschmarkt. This hostel is a couple of stations closer to the centre of town, a walkable distance on a good day, and was available for my extended time needs. What to do today? 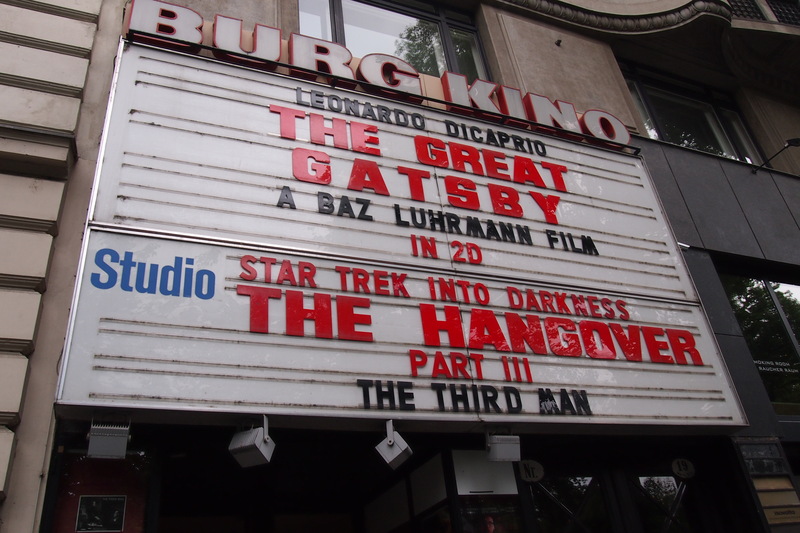 I had discovered in my reading that ‘The Third Man’ movie has quite a cult following in Vienna. I hadn’t realised that it was actually filmed there in it’s entirety. So this 1948 Orson Welles original is shown at the Burg Kino 3 times a week, one session is at 2pm on Sunday so off I went. I don’t know why on earth I went as early as I did, it’s one thing to be early to find a place but quite another to be 3 hours early! Mind you it did take me a while to find it but I was still 21/2 hours early on a wet Sunday in Vienna!. So I wandered on and found a lovely South American restaurant called Maredo on Opernring. A little expensive for my budget but after living on salami and cheese for quite a while it was time to shout myself a proper lunch. So exciting, they had lamb! And it came with pan fried vegetables and potato – yum. I may not have mentioned yet but lamb is my absolute favourite red meat and it’s not easy to find outside of Australia. The lunch was very nice indeed. So then I shouted myself a dessert and coffee as well. I stretched it out as long as I could and then headed back to the cinema. 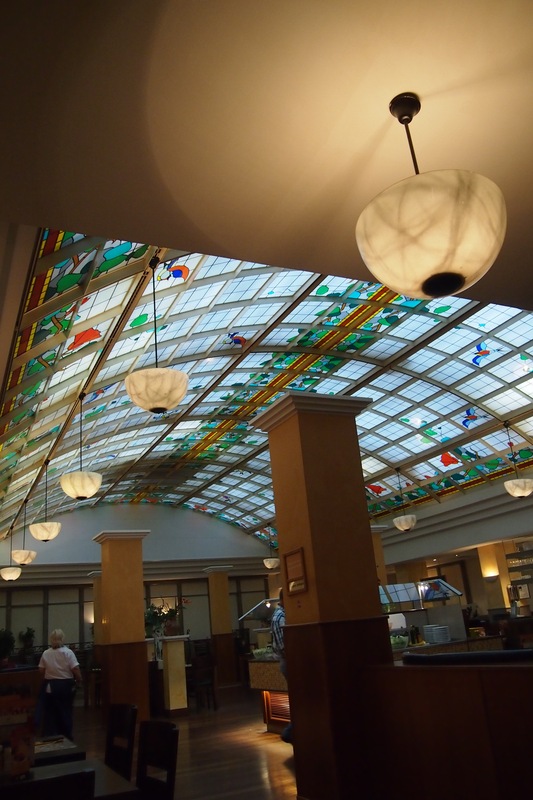 The interior of the restaurant was very pleasant and decorated with taste and interest, so it wasn’t hard to spend time there. Back at the cinema after waiting a little while for it to open, I discovered that there were balcony tickets. 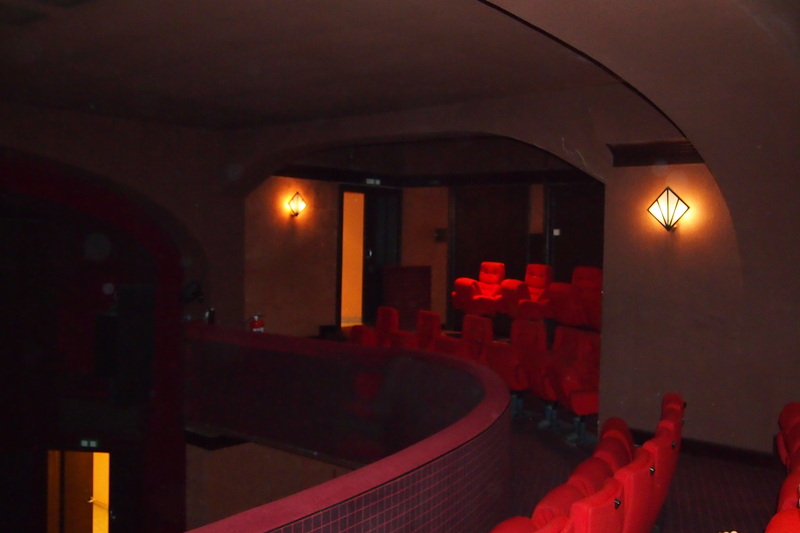 What a delight to enter a cinema to the sight of red velvet seats on the balcony. Most of the people, including me, immediately headed to the front row of the balcony (for old times sake) only to discover that either the seats were too low or the balcony rail too high and from there we could only see half the screen. So there was a mass move to the 3rd and 4th rows. I do believe that I may never have watched this movie before, or if I had I’ve totally forgotten. And there it all was, all the bits of Vienna I’d seen from the bus, the ferris wheel, the streets, the parks, OK, I hadn’t been in the sewers and did not intend to go. There are actually Third Man tours of Vienna that take you to all the places in the movie including sewer tours. I really enjoyed spending that wet afternoon watching a classic old movie. And so it was back to the hostel to chill and plan the next day. To my horror, I discovered that this hostel sends an online message at 7pm that the wifi will be shut down from 7-8 and everyone has to go to the bar to socialise. Well! You can possibly imagine that this was not going to sit well with me. Off I stomped to reception to complain, all I got was a shrug of the shoulders, the explanation being ‘it is the company policy’. 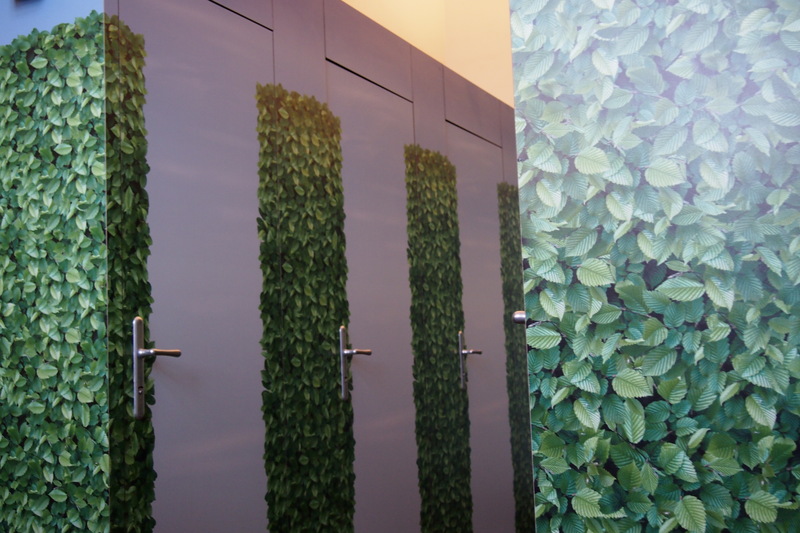 When I said that the other hostel in the chain didn’t do this the answer was ‘they will’. So there I was, no wifi and not wanting to go to a very noisy bar with lots of people getting drunk. Don’t get me wrong, I love socialising and do enjoy the odd bar but I don’t like being forced into it and I dislike large noisy bars where it is impossible to talk to anyone and all I end up with is a headache. I understand the theory behind this policy but not everyone wants to spend every evening in the bar, not even all the young travellers want to do that, I know, I talked to my dorm mates. A very inconvenient policy indeed. So out came the book and the ipod because needless to say the wifi didn’t come back on at 8pm as promised, I gave up trying at 10. Apart from that issue these hostels are very good and I hope they have re-thought that wifi policy. Tip: check everything before booking eg can you pre-book a lower bunk, is there wifi, does the wifi get shut down at any time, etc etc. I generally found that the bigger the hostel the more impersonal they are. I walk on my own. Although it would probably be nice to join a walking tour group I know my physical limitations and there is not much time in those groups to take a break every 45 minutes, they just keep on moving. For those travellers who don’t have any limitations in how far they can walk those groups are usually wonderful, cheap and informative. Even though this was yet another cold and wet day I headed off for my own history walk around the old town. I had the map and I knew what I wanted to see so off I went, clothed in my new weatherproof jacket, Bundaberg rain poncho and a souvenir umbrella clutched firmly in my hands. I might as well not have taken the umbrella, the wind was ferocious so in no time the umbrella was turned inside out. My clothes felt clammy as the wind blew them against my body, but I wasn’t going to be deterred and I still managed to get to most of the places in which I was interested. Firstly, the Spanish Riding School. I found that there would be no performances while I was in Vienna, had I checked this earlier I would have been able to catch one on the weekend – oh well! However, the public can buy tickets to the morning training sessions as well as go on a guided tour of the facilities, so I decided to do that the next day (Monday is a rest day for the horses). Memories of going to El Caballo Blanco in Sydney with my young son and my parents flooded back. It’s gone now so seeing the original was going to be a treat. Next was a quick stop by the small area of Roman ruins in the middle of Michaelerplatz to get a better photo of the explanation. I had taken photos the previous day but had forgotten to photograph the plaque, photos are my memory bank after all. Tip: Always take photos of the explanatory plaques right before or straight after the photo of the object. Trust me, you may think you will remember what you took, but a few years after your trip you can find yourself wondering what is in the photo and why did you ever take it. 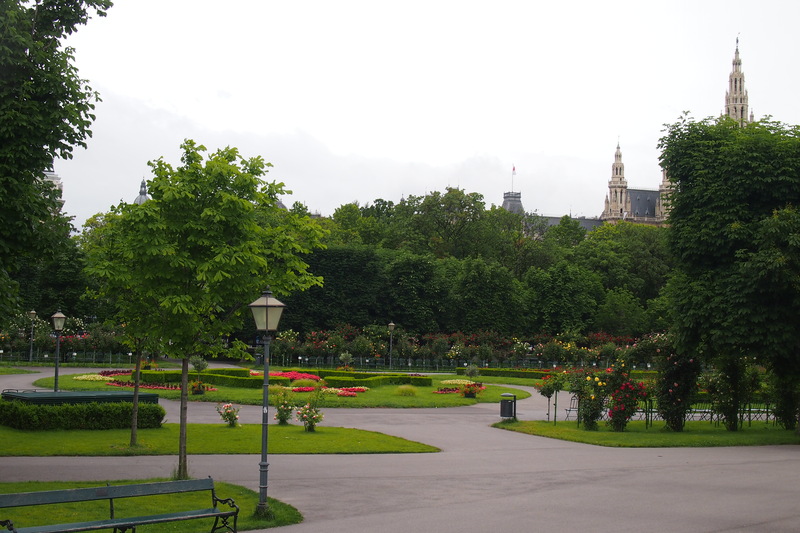 Next goal was to find the Volksgarten (People’s Garden) laid out by Ludwig Remy in 1821 and opened to the public in 1823, success! A beautifully symmetrical garden of mainly roses. In there I discovered the Theseus Temple. This is what I love about not knowing too much about a place (just enough to get me out there exploring and stumbling across amazing things that cause me excitement and reasons to explore and learn more). This temple, completed in 1821, was created by Pietro di Nobile in the neoclassical style. It is a small replica of the temple of Hephaestus in Athens (which I had been thrilled to see back in 2006) and was originally designed to house Antonio Canova’s statue of Theseus which was moved to the Museum of Fine Arts (Kunsthistorisches Museum) in 1890. 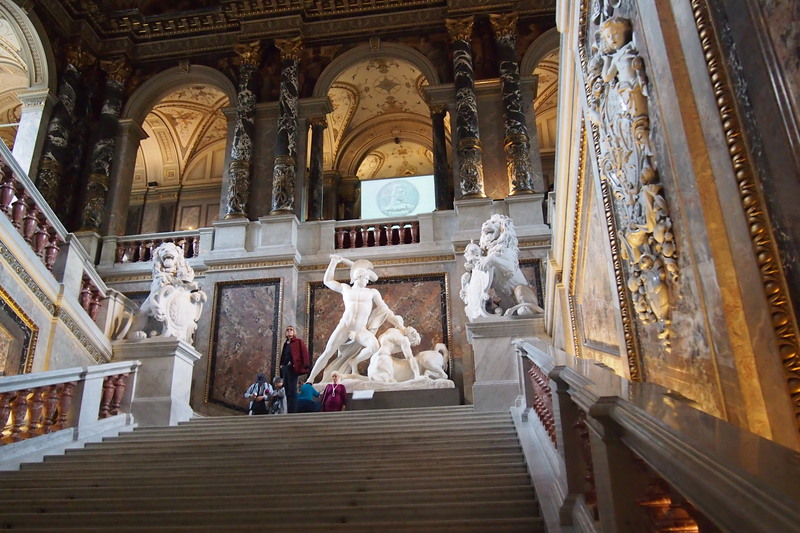 Yes that same sculpture of Theseus slaying the Centaur that enthralled me on the steps of the art museum. 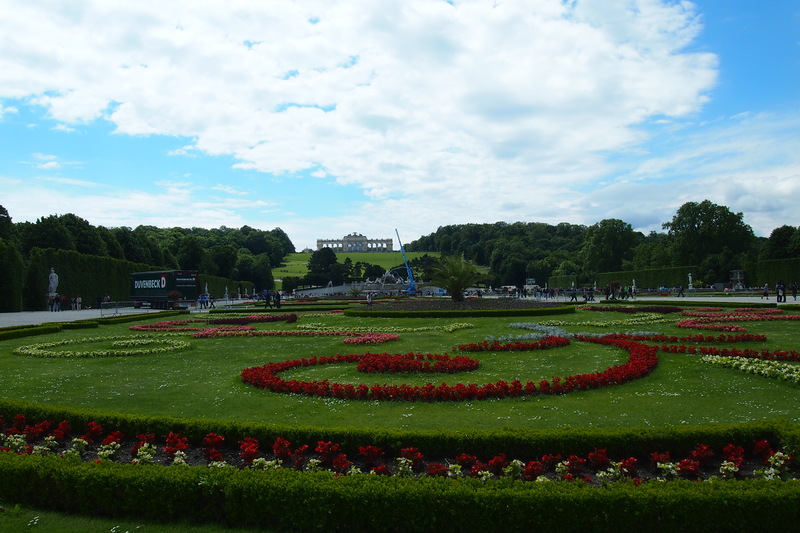 Part of the Volksgarten and the beautiful roses. 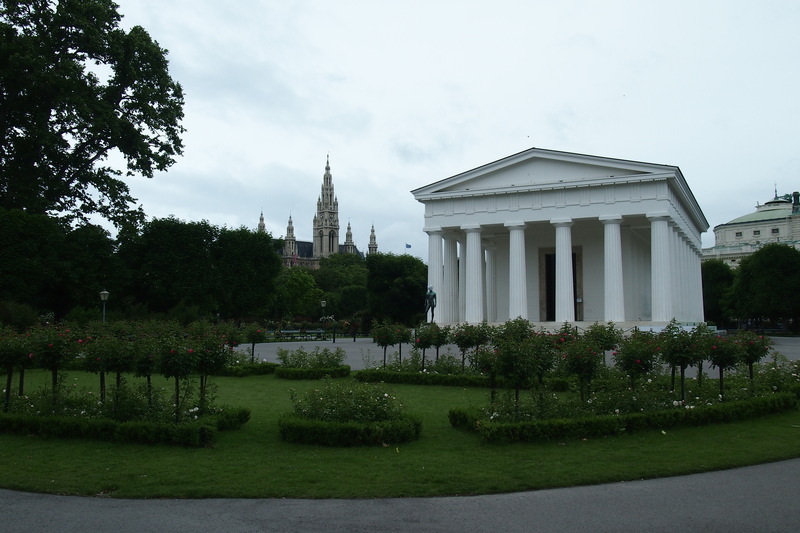 Theseus Temple in the Volksgarten. So, through the park, stopping to take heaps of photos of beautiful roses, across Dr Karl-Renner-Ring to the magnificent Parliament House built in the classic Grecian style. What an amazing structure and I thought rather unusual to find in Austria. However there is a reason for the choice of design. 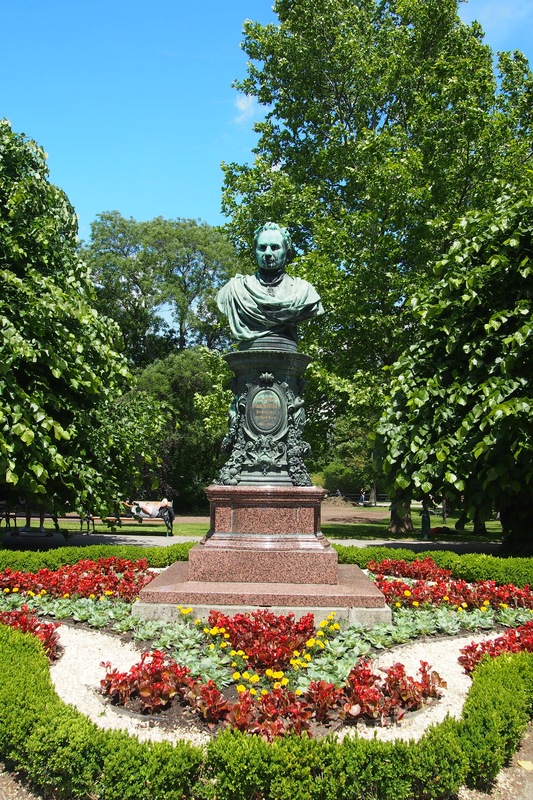 When the Imperial Commission was appointed to consider the design it was influenced by the industrialist/politician Nikolaus Dumba who preferred the Greek classical style. After all, it was a style conducive to and appropriate for a parliament, given its connection to the seat of democracy. 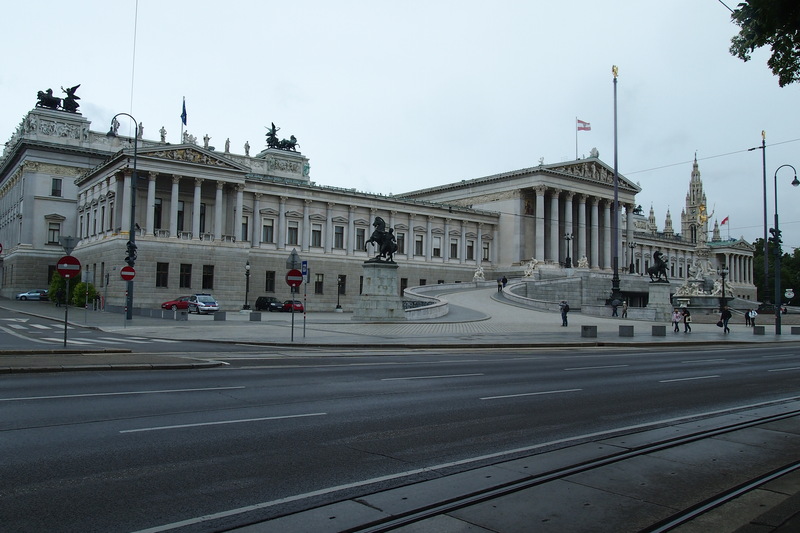 The successful architect was Theophil Hansen and thus this amazing Greek temple stands in Vienna serving the parliament. Rain and wind not withstanding I continued along Rathausplatz to City Hall, a gothic style building designed by Friedrich von Schmidt and built between 1872 and 1883. I loved the arches and spent quite some time trying to get a few good shots, not sure that I succeeded but it was fun and at least I was under cover for a little while. Playtime amongst the arches over, it was forward again up Reichsratsstrasse, past the university, across Universitatsstrasse to the Neo-Gothic Votivkirche (Votive Church). 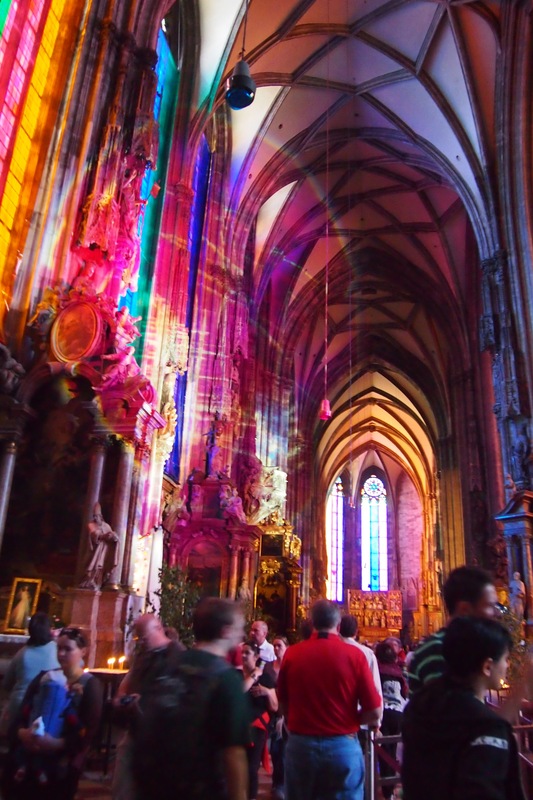 The concept for this church came from a failed assassination attempt on Emperor Franz Joseph by Hungarian nationalist Janos Libenyi on 18 February 1853. 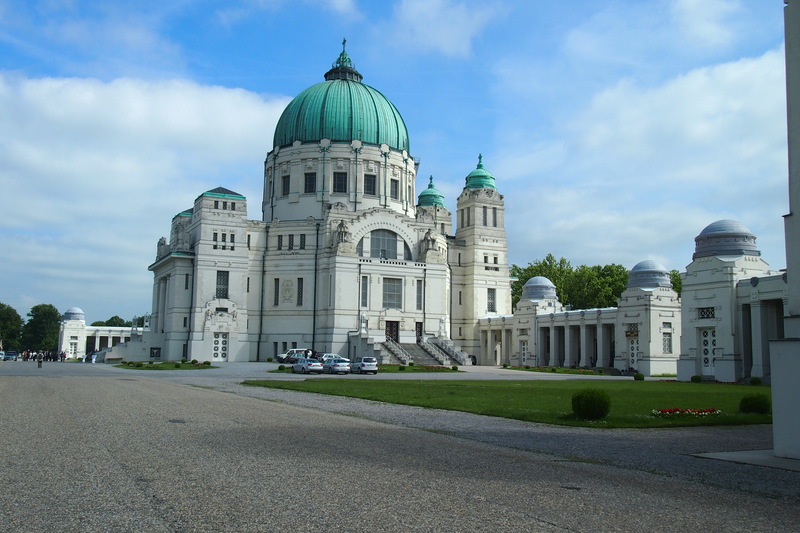 The Emperors brother Ferdinand Maximilian Joseph, who later became Emperor of Mexico, asked for donations from all in the Austro-Hungarian Empire in order to build this church in honour of the rescue of the Emperor. Walking from the station I noticed that the markets were on. The young lady at reception on Sunday told me they were only on Saturdays – darn it, could have been cooking cheap meals for a couple of days. The Joy of the Spanish Riding School and the Lipizaner horses. The Spanish Riding School was today’s entertainment. I ended up sitting in the second level of the viewing area, which is pretty high up in that arena. So beautiful to watch those lovely horses being trained. They did half hour sessions with 5 horses at a time. The riders look so smart and the horses look regal. The arena is huge but not originally built for the public. The Emperor created it to be used as entertainment for the royals and their guests. As a result some seating doesn’t have the best view of the arena. The horses are all born grey (except the throwbacks to the original breeds which can be brown or black). As they age they turn white, that can happen any time after the age of 4. It takes about 6 years to fully train a horse and almost double that time to train the rider to full competency, what a commitment! The arena has a mix of sawdust and fabric under which is a layer of rubber sitting on natural clay, this makes the whole thing softer for the horses. Sadly we weren’t allowed to take photos in the arena however this was permitted in the tackle room, better than nothing as proof of being there. 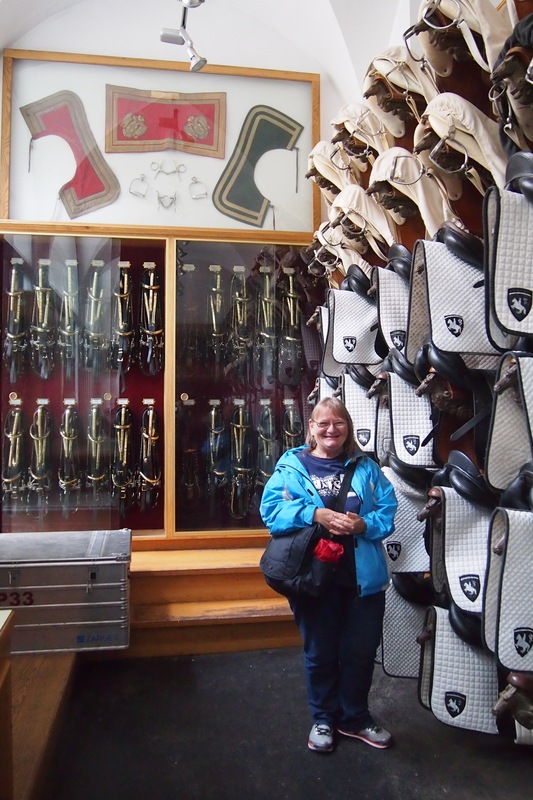 The Spanish Riding School tackle room. The excitement of the horses over off I went for more walking, searching and exploring. 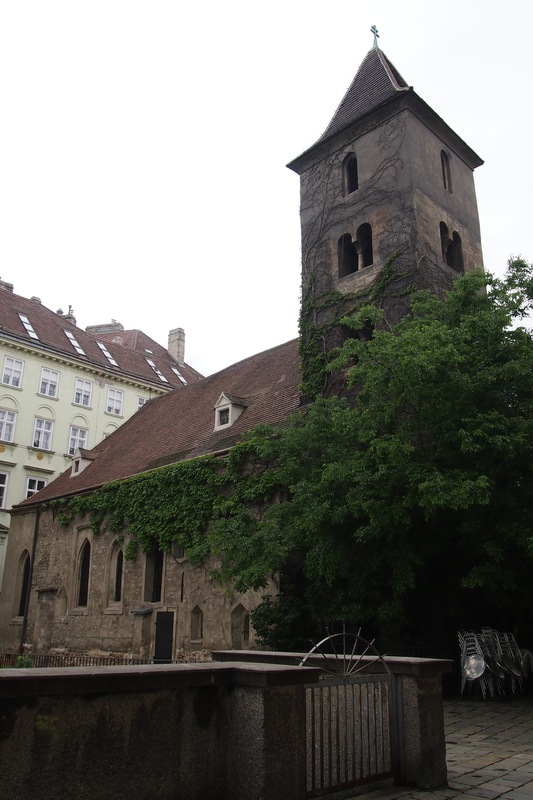 After quite a walk following my map I finally found the oldest church in Vienna which dates from the 11th Century. Ruprechtskirche is a dark and stark church. Unfortunately you can’t go in so I have no idea what the inside looks like, no doubt also rather stark judging by the exterior. 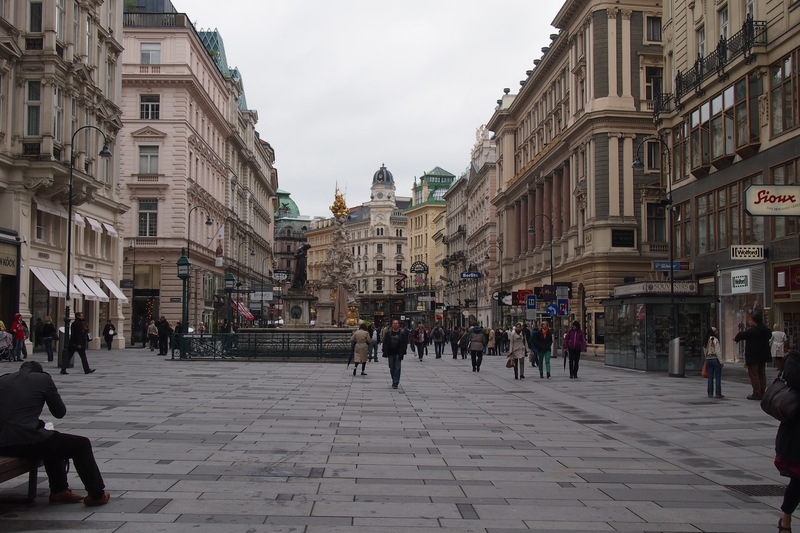 Of course in amongst all that walking there were coffee stops and finding various shopping streets not the least of which was the very famous shopping pedestrian street Graben, the centre of Vienna. One of my long held dreams was to walk in the Vienna Woods. Why? 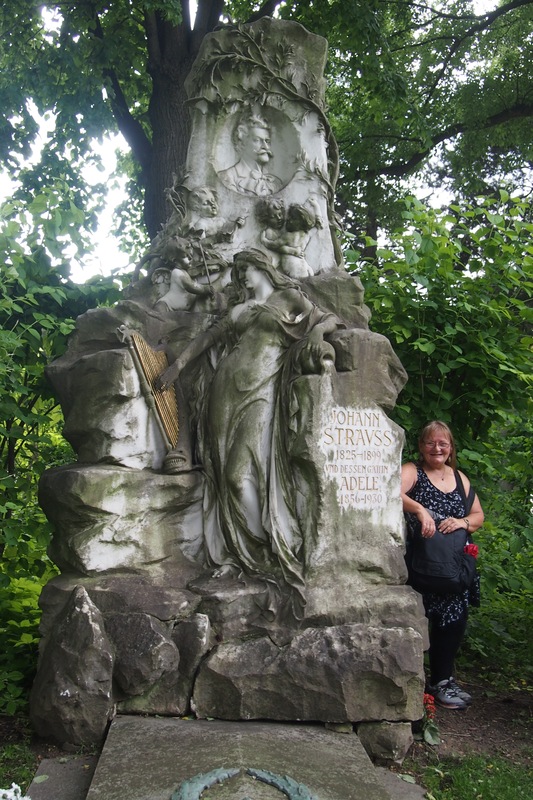 Well, ever since first hearing Strauss’s evocative Tales From the Vienna Woods’ I have wanted to go tree hugging there. 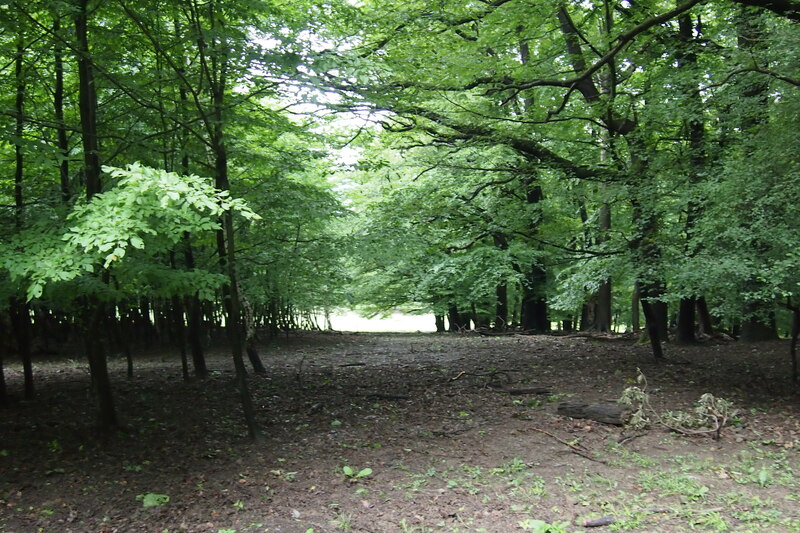 Thanks to a friend from my poetry group who lived in Vienna for some years I had the directions to the Lainzer Tiergarten part of the Vienna Woods. From Westbahnfof the U4 to Hutteldorf cross the bridge to the left, go down the curved ramp and continue walking through a little park area between houses on the left and the motorway on the right. After you pass the railway crossing take the next street left then the first right, keep walking till you see the green sign for Lainzer Tiergarten to the left (it’s not far) turn left and at the end of that short cul de sac is a wall with a wooden gate and door, this is the Nikolaitor (Nikolai Gate, called that because of the old tiny St Nicholas chapel just near there). The tiny, now unused, St Nicholas chapel. Once inside the wall there is a little wooden building as well as a feature with lots of information about the nature park. Lainzer Tiregarten started life as a private hunting ground for Frederic I when he decided to wall off 6,054 acres of the Vienna Woods for his personal family hunting ground, now it is a protected nature reserve where the only threat to the animals’ peace and quiet are joggers, picnickers or tourists with cameras. I was lucky to see a Mouflon, a wild sheep species, pity I didn’t manage to get a photo, he was a beauty with massive backward curled horns. He stood and watched me while I changed to my long lens and just as I lifted the camera he took off at high speed through the trees. Drat! What amazed me was why he would feel threatened by a person standing still changing lenses as slowly and quietly as possible, had he been threatened in some way in this peaceful park? Then there was a herd of wild pigs with heaps of babies, a few beetles, birds and squirrels. There is a whole lot more wild life there as depicted on the many educational notices along the way, but unfortunately I wasn’t blessed to see all of them that day. 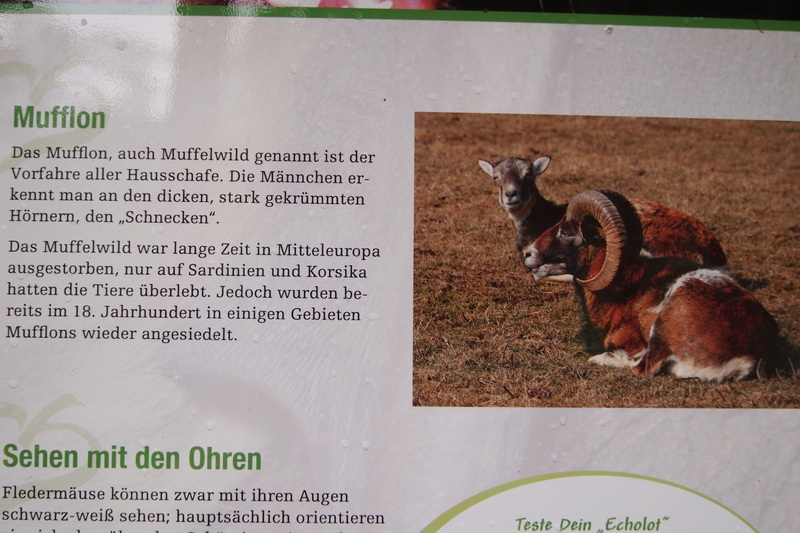 This is what that awesome Mouflon looked like. 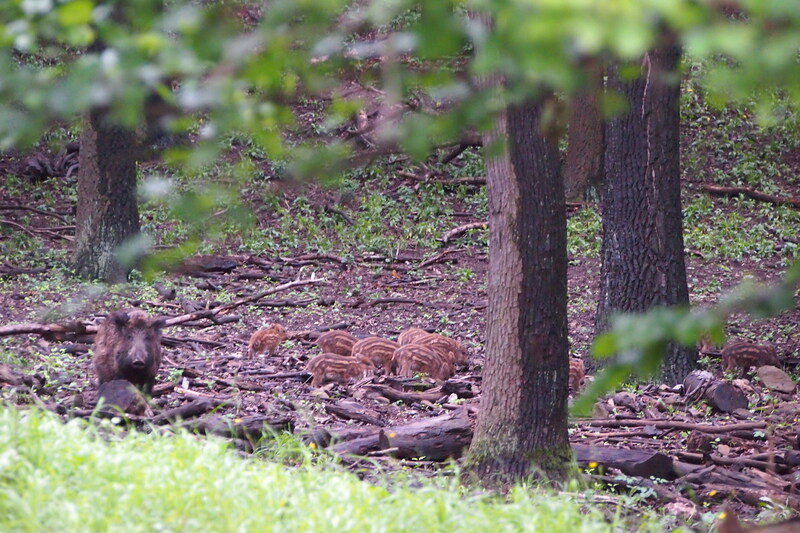 Wild pig family in the Vienna Woods, the babies are so cute. I certainly knew there were lots more birds there as the twittering got louder and more varied as I got further from the noise of the traffic. Even the small area I saw in the few hours I had was just stunning. 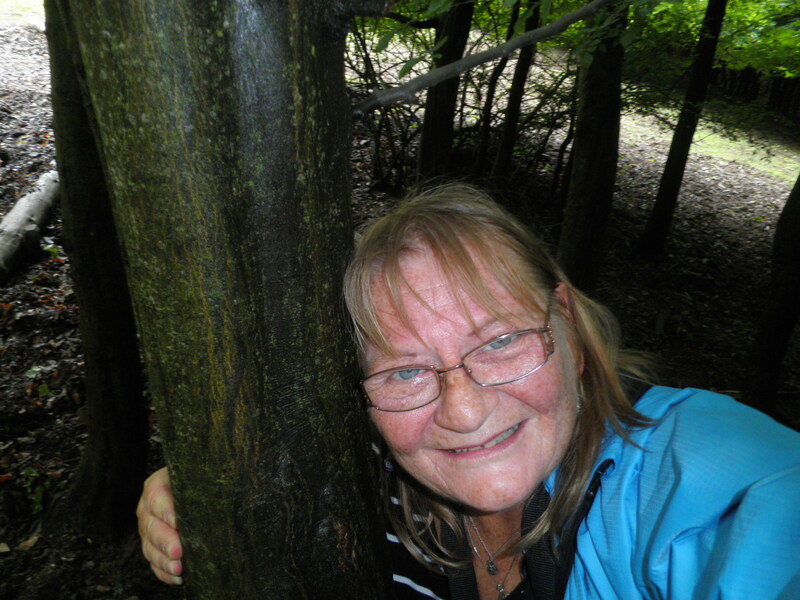 It was a cool misty day, on the verge of more rain, so the Woods had that rain-forest feel and smell to them – oh heaven! I could see how woods like these gave birth to amazing fairy stories. I really did expect Little Red Riding Hood, to come skipping out of a clearing, or the wolf to come loping out of the trees, perhaps even Hansel and Gretel running away from the wicked witch. I’m glad it wasn’t sunny and warm, I walked for several kilometres and the atmosphere was spectacular – I think sun would have caused a totally different feel. I thoroughly enjoyed that little nature break in my holiday. So if you are in Vienna, and you have had enough of tar and cement, take yourself away from all of that and head to the Vienna Woods, you’ll be very pleased you did. That night I met an awesome lady – 10 years older than I am, from Brisbane doing a similar trip to mine for similar reasons, she’s just been dong it for a little longer. Her mother also passed away and she has been travelling ever since, also on her own going where the wind blows. She admitted to being lost in her life, it gets a bit that way when there’s very little family left. She was a wonderful person to chat to, so full of life and adventure. It’s a tough gig this getting beyond the stress and grief of mothers dying and siblings and other family being callous greedy individuals. Meaningful or not it was interesting that I should meet her on the 33rd anniversary of my favourite brother’s passing! The morning was taken up with a sleep in (after 2 sleepless nights) and packing as tomorrow I leave Vienna. At breakfast I ran into the new friend I’d met the previous night and I happened to mention that there was just one more thing I wanted to really do before leaving Vienna. 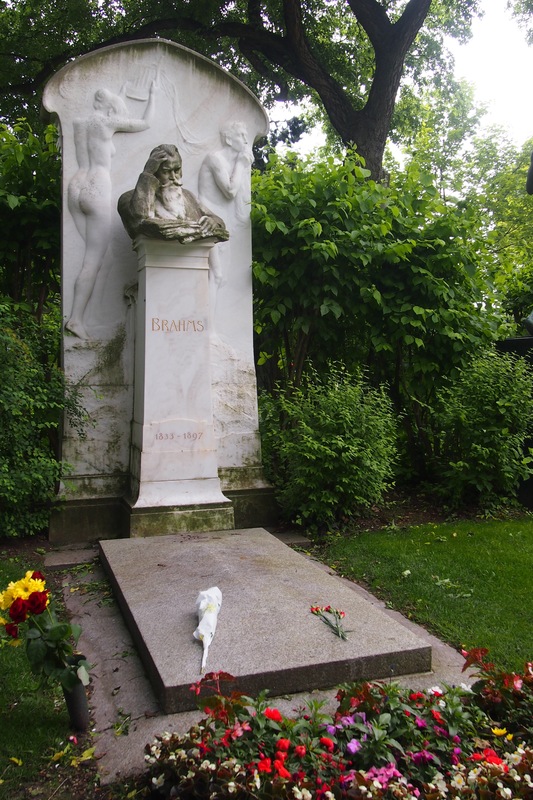 That thing was to go to the Central Cemetery and find the graves of the composers buried there, so she asked if she could join me. We set off in the afternoon after getting directions from the reception staff. 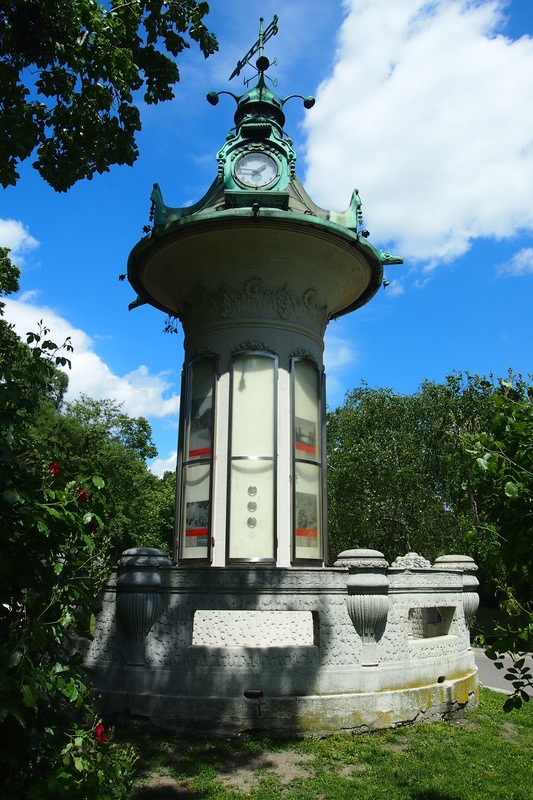 The U4 to Karlsplatz the tram #71 all the way to Zentralfriedhof Tor 3, then a short walk into the cemetery. So off we went to the ends of Vienna, hoping that we knew what we were doing, it was rather refreshing having a fellow solo adventurer with me. We picked up a map of the cemetery knowing that we would never find our way without one, it is such a huge place. First we wandered a little through the Jewish cemetery. Very sad to see so many who’s death was just listed as Auschwitz. We then headed off to find the composers. We got to the huge Church of St Borromeo (also know as the Dr Karl Lueger church) it is a very large beautiful church topped with a gorgeous copper dome. Unfortunately it was closed so we couldn’t get a peek inside. Not far from the church we noticed a rehearsal of some sort happening so we sat and listened for a little while. A dear lady told us (lucky I have a little German left) that there was a free concert starting at 5 going till 7, it was 4 so we rushed off to find the composers. Using the map proved to be very unhelpful, we looked for ages and found lots of interesting headstones but not the composers. Then we decided to use our intuition and go back to where we had seen a group of tourists with a guide. Yes! That was where the composers were, the map had given the wrong section number. That achieved we were back at the concert by 5 and settled into our seats. 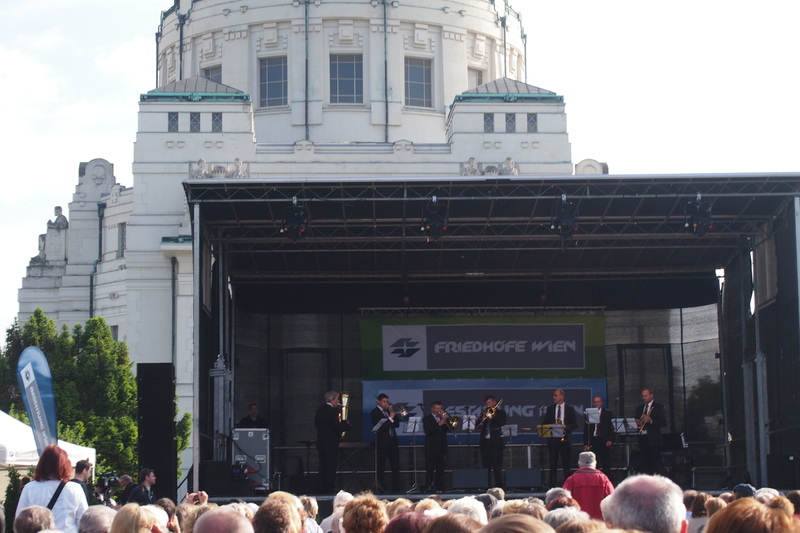 Now, seriously, opera, Queen and New Orleans jazz in the cemetery – who would have thought! 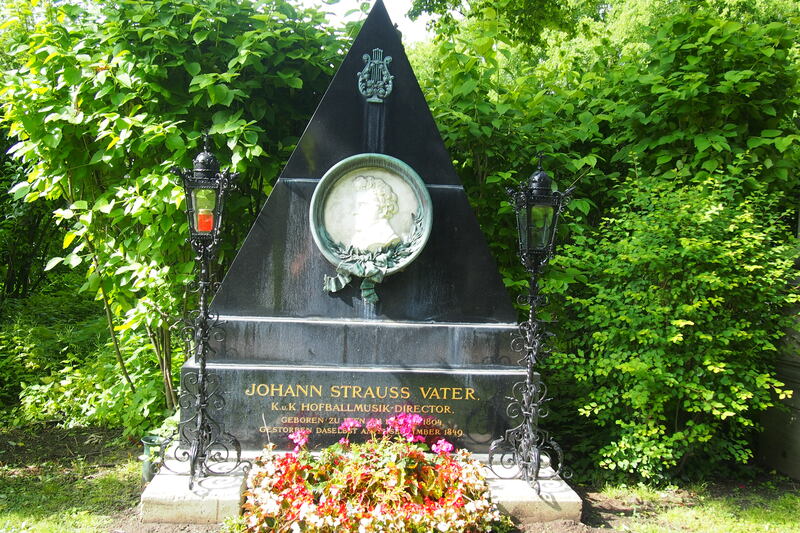 Set up in front of the massive church and right next to the graves of Strauss, Brahms Beethoven etc. What a treat! 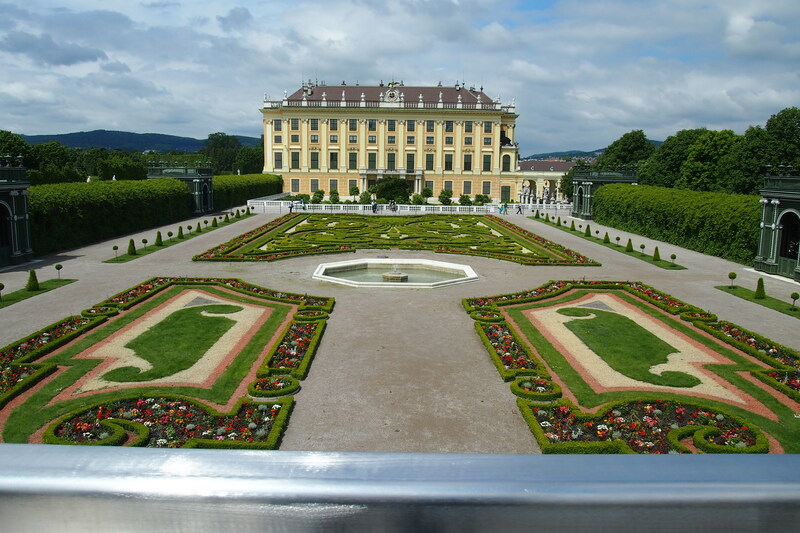 Coming across this made up for missing the one at Schonbrunn! Great things just kept happening on that trip. Next time I think I’ll do the tour, the cemetery is so big and there is so much history buried there that it is impossible to do it all alone. And so ended 10 glorious days in Vienna, albeit very wet and chilly days. Probably rather fitting that the last thing I did was to visit the cemetery! Yes, it rained most of the time but I learned back in 2006 (when it rained every second day in every country I visited to the point that by the end of six weeks my shoes were rotting) that rain will happen, that is no reason to miss out on sight seeing. My mother’s words often come to me on rainy days ‘you aren’t made of sugar, you won’t melt if you get a little wet’. The evening was spent taking photos in reception, finishing the packing and getting ready for the next day’s long 9 hour trip to Dresden by train. One day I hope to return and I hope to hear how my adventuring new friend gets on as well. And so, farewell beautiful Vienna I now understand why that lovely song ‘Wien Wien Nur Du Allein’ was composed.